Explore the Emerald Spire Superdungeon in style with this custom-made collection of characters, treasures, and more! Item cards help you track loot and equipment, Face Cards depict important NPCs and monsters and Quest Cards summarise key adventure goals to keep players on track. 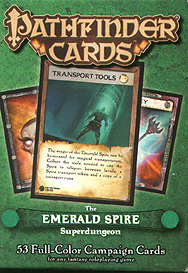 Designed specifically for use with Pathfinder Module: the Emerald Spire Superdungeon this epic, beautifully illustrated 53-card deck shows players the many secrets lurking within the Emerald Spire!